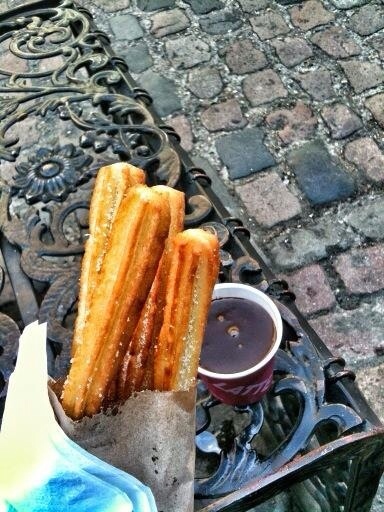 This afternoon, while exploring the Camden Market area, I stopped to try some traditional-style churros and hot chocolate. They were quite delicious. The hot chocolate was not your watery cocoa water that Americans associate with hot chocolate. This was literally hot, thick melted chocolate. It. Was also delightfully fun to eat. I would dip the churro, pull it out to let the chocolate cool, then dip it again for a second layer of chocolate before chowing down on it. It was a rich indulgence, but I did extra work in the gym today and walked a few miles extra, so I felt it was well-earned. More food adventures are on the horizon, from Gastropubs, to kebabs, to Indian food, to a further exploration of market food! Stay tuned!